Niche line Keiko Mecheri has launched Bois Satin, a new vanilla-focused oriental fragrance for women. The last releases from the brand were 2013's Savile and Sedona Blue. Additional notes include saffron, jasmine, rose, suede, patchouli and amber. 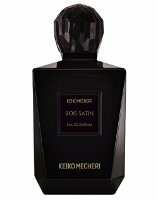 Keiko Mecheri Bois Satin can be found now at MiN New York, $115 for 75 ml Eau de Parfum. Good to know, I’ll try it when I have a chance. The citrus-vanilla combo got me thinking: does it compare to Shalimar, somehow? Yes, it’s in the philosophy of Shalimar but the scent is different of course. Then it will be the first one from this line I will try. I like this fragrance so much. Many things I love are in it: vanilla, saffron, and a complexity underneath that makes a price reasonable by today’s standards. Amazing that it is considered unisex as I favor feminine. This is on my eventual acquisition list.